There are times when a local organization goes so above and beyond their call of duty that the community feels compelled to recognize them. In order for Growler Haus to highlight the courageous work of the Humane Society of Cherokee County (HSCC), we have partnered up to create Poses for a Paws: Yoga & Beer Flight Fundraiser. Come out to Growler Haus in Spartanburg and for $15 enjoy a 75-minute yoga class (bring your own mat!) and a complimentary beer flight. After yoga, we'll be having brunch with an exclusive Small Bites menu and Mimosas. A portion of all sales will be donated to the HSCC. Ready for beer, food, and awesome live theater? Well, wait no longer! So, what is Drive-By Shakespeare? It's a little bit theater, a little bit comedy, and a whole lot of madness. A cast of actors are assigned their roles and given 2 weeks to learn their lines. They get NO rehearsals. YOU PROVIDE THE PROPS and heckle the actors when they can't keep up. Oh, and it's at a bar. Yes, it's the theater experience you've always dreamed of. Our local Spartanburg friends at Scrappy Shakespeare return to The Haus! Get ready for a performance of Romeo and Juliet like you've never seen before. A small group of local actors will take over the store and give you a one of a kind show. While you're here, enjoy some Haus Bites specials and Tasty Craft Beers, too! Growler Haus and New Groove are excited to collaborate once again and announce that The Haus Juice is BACK! "The fruit we have prepared for this batch is Pink Guava Strawberry. I had this flavor combination in a sparkling water recently, and found it very refreshing. The strawberries are local grown strawberries from Belue Farms here in Boiling Springs, so the beer will come with a great story of locality. Intent is that the strawberries are a little more forward than the pink guava." They will also be taking over a few taps for the event as we celebrate their beers. Come enjoy some local Growler Haus collaborative beers that you can't find anywhere else! Introducing... a brand spanking new collaborative beer with our Spartanburg friends at RJ Rockers! 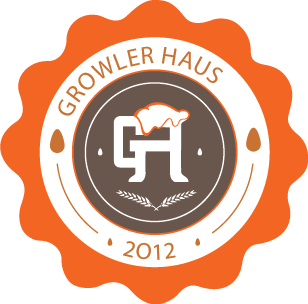 Growler Haus is proud to give you the RJ Rockers Haus "Tribe Vibe IPA". You can be one of the first people to taste the exclusive new Haus Beer - one you can't get anywhere else in the world but at a Growler Haus! The RJ Rockers rep will also be in the store to talk more about it with you. Come out to Growler Haus in Spartanburg on June 2nd at 11am and for $15 enjoy a 75-minute yoga class (bring your own mat!) and a complimentary beer flight. But why are we supporting the HSCC? You see, the HSCC doesn't get to operate out of a shelter like most Humane Societies do. They run on zero county/state funding and exist soley by the kindness of volunteers and private donations. Nearby animal shelters like the Gaffney animal shelter are kill shelters where animals only have a few days to be adopted or they are put down. But because of poor resources, the public cannot visit the Gaffney animal shelter to adopt the animal. It is up to the HSCC to visit the shelter each week and take photos and tell stories of these pets to try and find homes for them before their time is up. People can apply to adopt, get approved, and the HSCC will work with the shelter to facilitate the relocation of the animals to their new homes. The HSCC is willing to go the extra mile to make sure these pets are able to find new, safe, stable homes with loving pet owners. It is this dedication that has inspired us to partner with them for this event. Please share with your friends as the more support we can give this event and the HSCC, the better chance a loney, scared pet will be able to find its new home. River Rat will be in the Haus with some of their special beers for you to try. Come in and talk to the rep and grab a few pints of a local SC brewery. Drink 2 pints and get a free glass - while supplies lasts! Join us May, 25 for live music from the awesome local musicians known as Back Porch String Band! Music starts at 8:30, see you there! Join us St. Patricks day at 8:30 for live music from The Stinkbugs!! St. Patrick's Day at the Haus! Happy St. Patrick's Day all you lads and lassies! Okay, we may not be an Irish Pub, but everybody's Irish at least one day a year, right?! Chances to "get lucky" - gift card giveaways all day! We're open 11:30am - midnight, we hope to see you there! Join us March, 16 at 8:30, for live music from our friend Zach Parks! Join us for live music from our friends Bill and Tad's Excellent Duo, on Thursday March 15 at 8:30. Join us for live music from our friend Tim Bethea Friday at 8:30. What better or more savory combination than beer and sausage?! ?Much to our delight, we're bringing you a unique pairing featuring sausages from our friends at Full Circle Farm - SC in Chesnee, SC and their pasture raised pigs! We'll pair a flight of 4 tasty craft beers with 4 different sausages (and your favorite condiments of course) for only $15 - while supplies last, so we suggest showing up early! Drive-By Shakespeare is back at it again, folks! This time, the minds and talents of Scrappy Shakespeare and Proud Mary Theatre Company will be mastering The Taming of the Shrew! They barely know their lines, rehearsal is a joke, they're drinking on the job, they don't even bring costumes or props... but it's all intentional to bring you a unique Shakespearean experience - a Shakespearience, if you will. A $5 donation for the players is appreciated at the door and PLEASE bring the silliest costume pieces and props, since they just can't find any on their own! Join us for live music from our friend Mark Tebalt, Friday March 2. Take home a brewery glass with purchase of any two featured beers/flights - while supplies last!